Soapcalc is an awesome resource for soap making. But how should you use Soapcalc to formulate shaving soap? What do the numbers and factors displayed mean? How do you calculate lye ratios with Soapcalc? Soapcalc can be a relief when you’re just starting out in soap making. Finally, you can get some direct answers about how a recipe will turn out without using your ingredients and time to test it… right? Well, not quite. Don’t get me wrong – Soapcalc is great. It’s a good place to start when you’re trying to tweak a recipe. But ultimately, you have to make a recipe to really see how it turns out. Sometimes, what soapcalc will tell you and what the soap is actually like can be two different things. Plus, you have to keep in mind that Soapcalc was designed for body soap. We’re looking for completely different characteristics, so things that are ‘bad’ in bar soap might be good for us, and vice versa. Thus, Soapcalc’s recommendations might not always be the best path to follow. With that little disclaimer out of the way, let’s get into using and understanding Soapcalc! 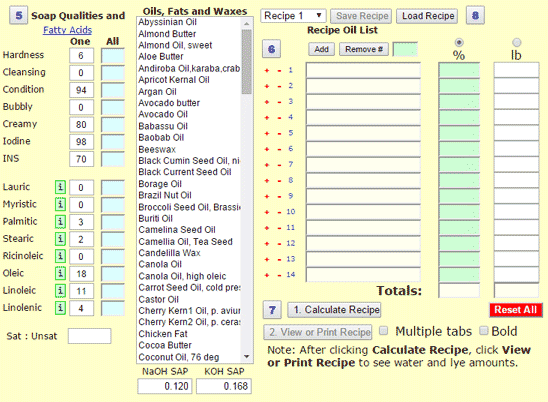 Lye, oils, water, fragrance & super fat in Soapcalc. This is where you simply select whether you would like to use NaOH or KOH. If you’re going to use 100% of one or the other, select that one; if you’re using a ratio of both, just select either one for now. You can read more about the differences between NaOH and KOH here. Don’t get tripped up on this one – this is the weight of the oils, not the weight of the resulting soap. Depending on the oils, water content, and other additives, 1 lb of oils will produce about 1.4 lb of soap. I recommend using the default 38% water as percent of oils to start with. As you become a more experienced soap maker, you might wish to cut this number by a few points. For now, keeping it as the default will make life easier. If you’re following the basic shaving soap recipe and the suggested modifications from earlier posts, you may want to ignore these numbers in favor of the 1/4 oz (for super fat) and 1 tsp (for fragrance) suggestions there. But, if not, you can always calculate your preferred percentage of super fat and amount of fragrance. It’s really a case of whatever would be easier for you. Soap qualities, fatty acid profile, and oil lists in Soapcalc. OK, this is the part that most people are using Soapcalc for. When you add oils to your recipe, this section will tell you a) the fatty acid profile of your soap, and b) the predicted characteristics of your soap. Some say the fatty acid profile is more accurate (if a little less intuitive) when it comes to predicting what your soap will be like. I’m going to talk about the fatty acids in a future post, since I don’t want to overwhelm you with information. For now, let’s talk about the soap qualities section. When trying to understand this section, keep in mind the ideal qualities of a shaving soap. This one is not overly important. Try to keep it reasonably high, but not so high that it cannot be loaded on to a shaving brush. Of course, with the type of ingredients we’ll be using (specifically, stearic acid), your soap should be relatively hard. You want it to be solid. This is one of those cases where you shouldn’t worry that Soapcalc tells you your soap is too hard. If you’re using KOH as in the basic shaving soap recipe, it’s not going to come out like a rock. In fact, hardness can be completely misleading. Soaps with high cleansing will dry your face out. Keep this low if you can. Conditioning is a great quality to try to maximize in your shaving soap. This will leave your face feeling soft and refreshed. Some conditioning ingredients can also translate into a little slip for your razor. Keep this at a moderate level. Some bubbles are good, but if your soap is too bubbly it will produce suds and not thick lather. Creaminess is key here. This indicates the richness and stability of lather we’re looking for, so more is better. Try and keep this quite high. Some artisans of well-respected soaps claim to have recipes with 70+ for creaminess. As for Iodine and INS – don’t worry about them for now. They’re not as important for us as these other qualities. Ah, the fun part! Have fun losing half an hour (or more) fiddling around with this! What you do here is select an oil from the scroll box, then press the small + to add that oil to your recipe. Then, you can define the amount (in either % of recipe total or weight). Notice that when you select an oil, the numbers under Soap Qualities change. This will tell you (very roughly) what properties a certain oil will contribute to a soap. Calculating your recipe will take all the qualities of each oil, and work out what the soap’s overall qualities should be given the proportions of each oil. These values will show up under Soap Qualities below All. Then, if you want to change certain qualities of your soap, you can quickly compare individual ingredients to your soap recipe to see which numbers will move up or down. Once you’ve got the recipe where you want it, you can click View Recipe to see a printout-style page. These can be useful for reference when cooking your soap, or to keep a record of recipes you’ve tried and their results. This is also where you can figure out the amounts of lye you should use for a ratio. (e.g., if Soapcalc gives you a value of 150 g of NaOH, and you want to use 40% NaOH, you would use 60 g of NaOH (150*0.4) and do the same calculation for KOH). Finally, I just want to remind you that Soapcalc is not reality – it just tries to predict it. You’ll notice that the basic shaving soap recipe previously posted has a low conditioning number, and a high hardness number. If you just went off the Soapcalc numbers, you might think it’s not very good – but after you use it, you might disagree! So it’s important to remember that Soapcalc can lead you in the right direction, but it’s not going to take all the experimentation and creative effort out of formulating shaving soap. You’ll still have to try different iterations and see what works! Don’t forget to print and/or save your recipes – each one is progress! Thanks for reading this post at ShaverSoaper! Soapcalc is an invaluable tool when you’re starting out. I hope this makes it a little less overwhelming! This is probably one of the more user friendly Lye calculators I have used. Great breakdown of the calculator! Thanks, Matt! Yeah, Soapcalc is quite fun to play with once you’ve got the hang of it! Thank you for this recipe and this website! I have been looking for a shaving soap recipe as well as a coherent explanation of soapcalc. I think I have found both here. I look forward to trying your recipe. Soapcalc is great…if you’re using 100% KOH or NaOH. For a calc that lets you use both, try this. https://www.saffireblue.ca/shop/liquid-cream-bar-soap-calculator.htm . It doesn’t give you as much information about the fatty acids, etc, but it will give you an accurate measurement for combined lye. If I’m soaping by characteristic or creating a new recipe, I tend to use both sites.